Currently I am working on a new flower painting – it is a painting of a white pink Paeony. See photo below. I am doing a lot of runs and this year I was lucky to find a garden with a bush full of white paeonies. 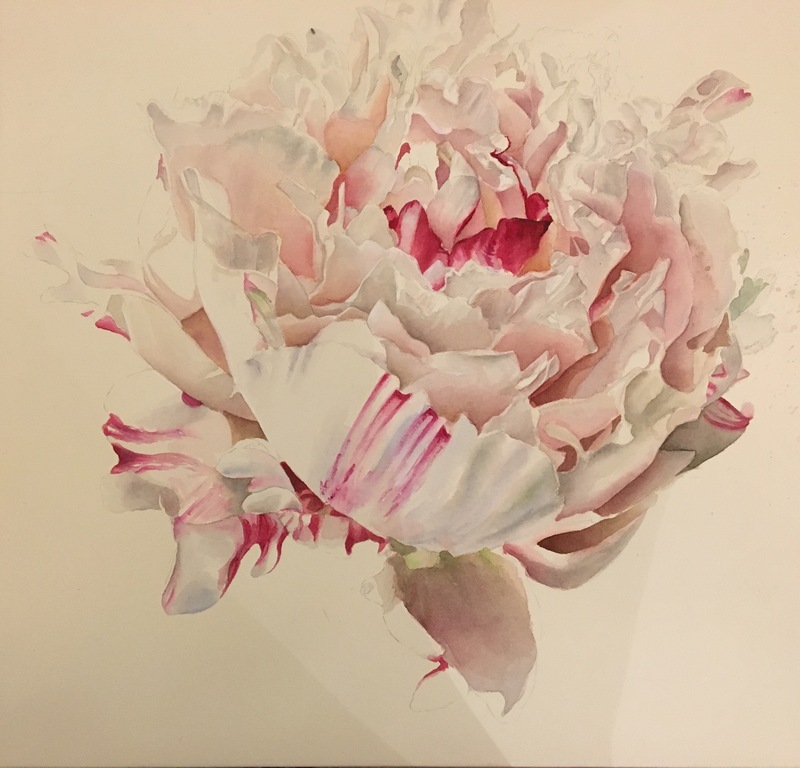 Paeonies are such special flowers – a lot of time involved when deciding to paint them – but I am sure you all agree that it is worth the time. Beside Roses I think this are the most beautiful flowers. I love all the crinkled petals and I love to create the shadow colours of this paeony flower. This is of course always a challenge but in the end it always looks great. The pinks are created with Purple Magenta for the cool pinks. I added some of Quinacridone Rose when I wanted to have a warmer pink. For darker pinks I added some Red. The shadows are created with pink, blue, green, a touch of yellow. In the center of the flower I used more yellow in the shadow colour – because the center of the flower is also the center of interest in this composition. The center of interest should be warmer in colour temperature than the rest of the flower. Warm colours help us to make this area more interesting and we want that the eye looks there. Playing with cool and warm colours help us also to create the realistic form of this Paeony Flower. Now I am thinking about the background. I do think that a dark background will add a lot of drama to this light coloured Flower and makes it pop. Maybe a few suggested leaves will also be there. I am not really sure. I do love white backgrounds, too, but I think that a dark background will make this painting more special. I will post another photo of the progress very soon.